Table tennis player Hyun Jung-Hwa (Ha Ji-Won) wins silver medals, but always comes up short in the gold medal matches against a rival Chinese table tennis player. One month prior to the 1991 World Table Tennis Championships in Chiba, Hyun Jung-Hwa hears that a single Korean table tennis will be formed from South and North Korea. The South Korean players and its coach oppose the idea. Despite the opposition, the united Korean table tennis team is formed. "As One" is based on the true story of the first ever united South and North Korean table tennis team that competed at the 1991 World Table Tennis Championships in Chiba, Japan. Actress Ha Ji-Won will prepare for her role in "As One" by receiving training from ex-national team table tennis player Hyun Jung-Hwa. The scenario for "As One" was written after several lengthy interviews with Hyun Jung-Hwa, who played on the 1991 team and a coach for the Korean national team. Filming began May 3, 2011 & finished September 30, 2011. CGI and post-process will finish sometime in late April. Deamon Sep 11 2018 7:07 am This was just a propaganda movie. I still liked it. Danniah Nov 11 2016 7:41 am It is so meaningful movie, esp for me as a Korean who lives abroad. So moving and warm-hearted. Tejas Sawant Aug 04 2015 7:37 am Ha Ji-Won & Bae Doo-Na Can't miss this! Phan Jun 20 2015 2:58 am Love this movie. A true amazing story. Love the cast too. Their acting was moving. Lianpi Mar 12 2015 6:09 pm I Love this movie very much. tp Feb 24 2015 10:43 pm This is just an amazing movie. I truly loved it. The cast members are superb! Thank you so much for making such a remarkable and meaningful movie. Kika Feb 09 2015 4:02 am Another korean amazing movie. Love this one! Lestibournes Nov 12 2014 11:44 am So basically, The King 2 Hearts as a sports movie. Azmida Fadzi Jun 29 2013 6:30 am the story of the two different nations, but they fight as one~ KOREA hwaiting! wix May 09 2013 4:04 am Ha Ji Won's co-star in the movie 'As One', Han Ye Ri, wins Best Rookie Actress Award presented by Suzy at the 49th Baeksang Arts Awards." fafa Mar 05 2013 1:01 pm A true story that will move your heart... my heart has already moved just by preview!! love for korea!! Den Oct 28 2012 11:14 am Very touching scene just even from this preview; the tension is so high just like some very good Korean movies about unity - such as Taegukgi and JSA. They have the special Korean spirit. If you are reading this and Korean, you should be very proud of the countless achievement in spite of hardship situation like politics. karang Sep 04 2012 9:00 am amazing movie.. highly recommended ! Raima Jul 13 2012 8:03 am great movie,......this movie was daebak. i cry, smile and so heart moving. HJW - BDN really a great act in this movie. real tennis player played by real actress. loved it so much. Min Soo Jun 12 2012 2:05 am As good as it gets. I went in not knowing that it involved ping pong, and was like "wth" when I saw, but then I finally recognized what it was all about. EPIC! all 4 of my grandparents actually escaped from Korea, but I don't wanna say that I'm a North Korean cuz theres no such thing. I'm Korean. the day will come when the country stands together as one! i believe it will happen before I die. i'm 21, so theres alotta time left. I am now realllyyyy motivateddd! if u guys need another movie, Rudy is also a greatttt movieee! its a football movie but u honestly dont have to know anything about football to understand y his story is so amazing. and if u do know anything about sports, then there is no way u cannot find it inspirational. Esther Jun 05 2012 6:11 pm This is a great movie. I just watched that in the movie yesteday in Australia. Ki May 10 2012 7:38 am With the first time pairing of popular Korean actresses Ha Ji-Won and Bae Doo-Na, the movie "As One" should grab the attention of lot of people. The movie follows in the footsteps of such based-on-a-true-story sports films like "Forever The Moment" and "Take Off," both films were also box-office hits and critical favorites. Personally, I eagerly went into the film with an extra large box of caramel popcorn (it gets addictive here in Korea) and the hopes of experiencing 2 hours of high adrenaline drama. 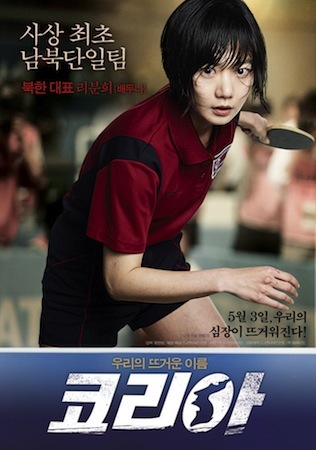 Set in the year 1991, "As One" follows two rival Korean table tennis players. Hyun Jung-Hwa (Ha Ji-Won) is the top South Korean table tennis player and Lee Boon-Hee (Bae Doo-Na) is the top North Korean table tennis player. Both players and their respective teams learn that Korea will field for the first time a "united" table tennis team at the upcoming World Table Tennis Championships in Chiba, Japan. Initially, players on both sides are against the idea and when they begin their joint training sessions they quickly realize that there are also lots of cultural differences between them. Can the Korean team even get along to compete against the world's best? As much as "As One" follows in the paths of "Forever the Moment" and "Take Off," I actually thought more of the 2002 Japanese film "Ping Pong" directed by Fumihiko Sori. I'll say when I first watched Fumihiko Sori's "Ping Pong" I was drawn in by the story immediately and amazed by the ping pong action. Unfortunately, I didn't have the same type of reaction with "As One." I can't quite put my finger on why, but in "As One" you could tell that the women were not really playing their table tennis matches and just mimicking the motions, with later CGI effects adding the ball movement. This was more noticeable for me while watching Ha Ji-Won playing her matches. Yet, the table tennis matches isn't the movie's downfall. In fact, after the first few matches I thought less about the "realism" and enjoyed the drama theater provided by the matches. The movie's actual downfall resides everywhere outside of the actual table tennis matches. The staff made a horrible decision in steering the film to a constant flow of forced wishy-washy melodrama. It got so bad, that by the time the scene with the South Korean team kneeling down in front of the training center rolled around I wanted to throw my caramel popcorn at the screen. Unfortunately, I ate all the popcorn by then. The movie just throws scene after scene of these types of corny moments to elicit emotions from the audition. It's like being forced fed 10 plates of cheap American style Chinese food at a $7.99 all you can eat buffet joint somewhere in Midwest America - when you're not even hungry. The logic behind this is even more surprising, when you consider the actual real life events has more than enough drama to conjure up mountains of emotions from the audience if they're just not forced fed all the excessive crud. Making matters worse for the film, the acting is about as subpar as the script. Outside of actress Bae Doo-Na, who does a fine job, there's just not a lot to get excited by the performances. The supporting cast dials up the worst comic book like characterizations of good and evil. As an example, it was just laughable to watch Park Jung-Hak (the bad guy in "Bedevilled") portray this comic book like Satan version of a North Korean official. On the South Korea side, an emotional "teary" scene featuring Park Cheol-Min just made me want to vomit. And there's tons more like this. Ha Ji-Won did better than the supporting cast, but her heavier emotional scenes seemed to bear the same type of inauthentic moments as her action scenes. You can quickly tell "As One" is a movie made to sell gazillions of tickets and smash every box office record known to mankind. To do this, the filmmakers probably felt they had to appeal to everyone: from hipsters in Hongdae, to the rice farmers out in the provinces, to the 5-year-olds who might nag their parents to take them to the cinema. This forced fed one-size-fits-all-approach brings down the film in a spectacularly horrid manner, with the final result a film that could very well make you upchuck whatever you had for lunch. A better title for the film might be "As If." Gtangerine Apr 10 2012 2:46 am All I can say about this film, with only it’s trailer being released is WOW. Ha Ji Won and Bae Doo Na are outstanding in playing their respective *roles. I hope to watch it even if I am not in Korea! Gtangerine Apr 10 2012 2:45 am All I can say about this film, with only it's trailer being released is WOW. Ha Ji Won and Bae Doo Na are outstanding in playing their respective looks. I hope to watch it even if I am not in Korea! r4ey Nov 14 2011 7:22 pm Can't wait to see this movie. After i watch many character in all her movies. Now i'll see a fresh character in this movie. 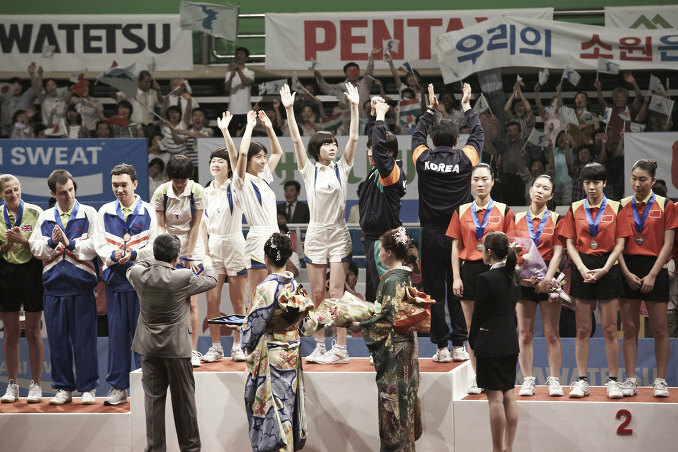 Yes uri HJW play a role as a champion table tennis player, hope this time no more received a critics again. Fighting Jiwon onnie...by the way where are u HJW ssi seems that u be quiet now. Miss u.
Momo Oct 25 2011 12:10 pm Bae Doona is known internationally whereas Ha Ji Won is very popular in Asia. so, Ha Ji won has more fangirls whereas Bae Doona has more fanboys. But, Both are equally good-looking and Both are very good actress equally. So, really interested about this movie as both of them are very versatile. i like their early dramas (before 2006) and all their movies. Bae Doona is a very cool avid photographer whereas Ha Ji won seems sweet. Bandi Jun 03 2011 9:39 am OMG~ i have always wanted to see bae doo na and ha ji won act together~~ exciting!!!! Kim Gilbert Jan 24 2011 2:25 pm AMAZING true story well worth documenting on film!! A very timely story to be told as well!! Good luck!! Anonymous Jan 06 2011 11:20 am Very interesting. GO KOREA!